Witnessing your favorite artist perform live is probably one of the most amazing moments you'll ever experience in your life. If you could just go to every single show they have so you don't miss anything about them, you would. But life's not fair. Plane tickets and accommodation are expensive, let alone concert tickets. Hell, you need to have hefty money to fulfill this ultimate fangirl dream. Thank goodness some television companies air special concerts too. WOWOW's promotional video for the 2018 Ambitions Japan Dome Tour coverage. ONE OK ROCK is a Japanese rock band founded by Yamashita Toru on 2005. 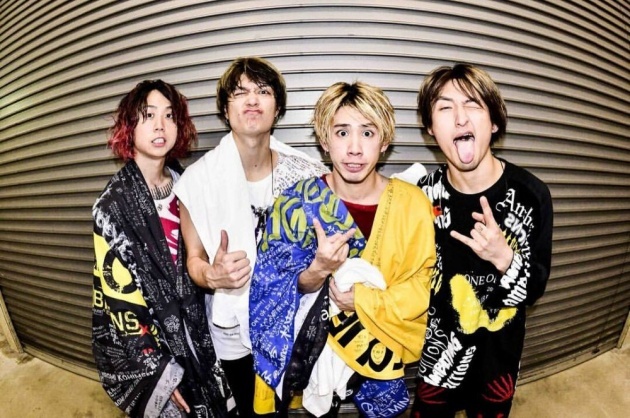 The band currently has four members namely Taka, Ryota, Tomoya, and Toru. ONE OK ROCK is a very popular band in Japan and also has a huge international fan base which rapidly grew after singing songs for the movie series of Ruruoni Kenshin. They are under the management of Amuse Inc. and are currently signed to two record labels, A-Sketch (Japan) and Fueled by Ramen (United States). After signing to their international label, they have been releasing albums and singles in Japanese and English version. The band also expressed that they aim to try other music styles while staying ground to their genre, rock. They don't want to sound the same and wanted to deliver a something new to their fans' ears each time they release new songs. Now let's move on to the Japan Dome Tour itself! 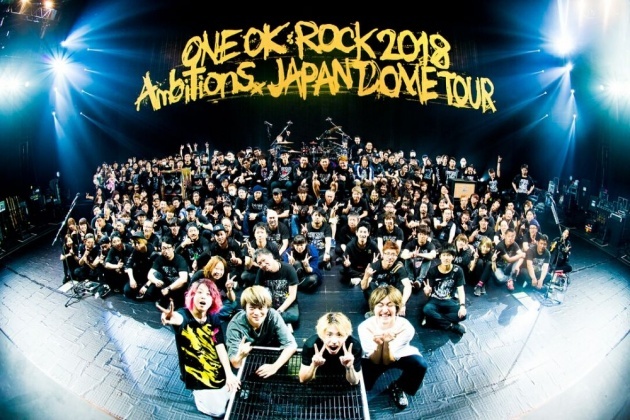 The ONE OK ROCK 2018 Ambitions Japan Dome Tour show aired on WOWOW was their 2nd day performance at Tokyo Dome last April 05. The tour was held on four domes, one of which is the Tokyo Dome. The other three were Kyocera Dome in Osaka, Nagoya Dome in Nagoya, and Yahuoku!Fukuoka Dome in Fukuoka. The show opened with a short graphic display appearing on all the huge LED screens at the stage. Like on their Ambitions Japan Tour last 2017 at Saitama Super Arena, the stage floor was also set up with LED. But what's more amazing this time at the dome tour is that even the extended stage at the center was now set up the same. Technically, the entire stage floor turned into a canvass for the graphic display. The dome was in complete darkness except for the stage. The stage floor was covered in smoke while a white shooting star-like graphic animation appeared on one side of the LED screens, slowly making its way to the stage floor, to the edge of the extended stage. By this time, the song "Taking Off" was slowly playing on the background. Another shooting star appeared on the opposite side and made its way to the extended stage. There were four shooting stars in total, probably representing each member in the band. It seems like the "shooting stars" joining together at the edge is building up into a huge energy, then taking the shape of an arrow pointing to the crowd before it scattered into pieces receding to the main stage and sparkling through the darkness. And this is when the crowd's LED bracelets turned on as well. 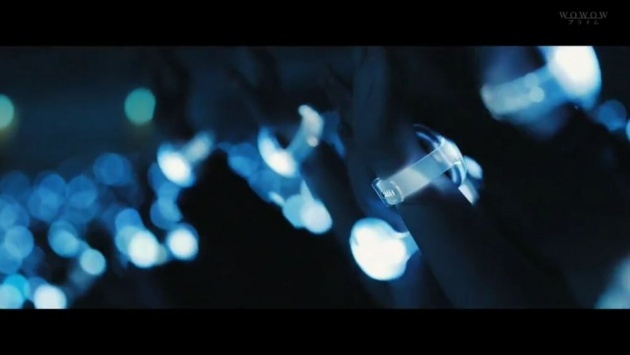 You could hear the crowd scream in surprise to see their bracelets light up. Every single person in the crowd was given this LED bracelet which I think was being controlled, for it turns on and off all at the same time. The white lights dancing in harmony was a breathtaking sight. 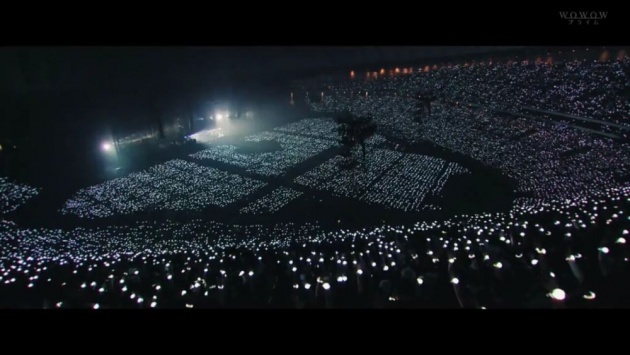 I would totally have goosebumps if I am in this crowd. Taka on spotlight while singing Taking Off. Finally, a spotlight focused at the tip of the extended stage, and Taka was there standing. 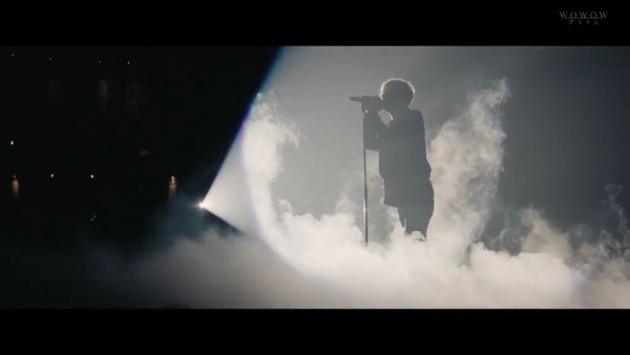 The crowd in Tokyo Dome cheered in delight as Taka began to sing the lines of the song in a slow and dramatic version. The song then picked up to its original beat after the intro. 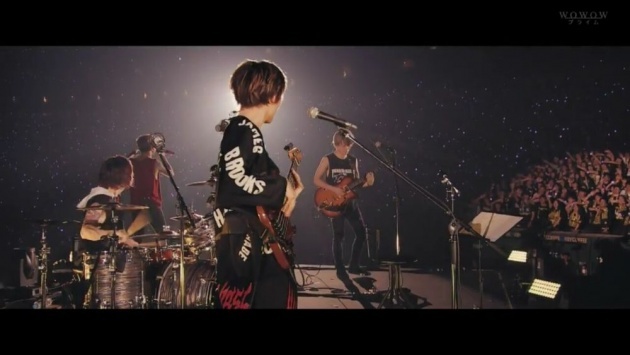 Lights on the stage turned on showing Toru, Ryota, and Tomoya already on the main stage playing their instruments. The crowd cheered even more finally seeing all the members. It was also then when I got a clear view of the extended stage. The tip of the extended stage was shaped into an arrow. Very much fitting for their "Ambitions" theme. As a viewer, the arrow pointing outward means pressing forward to reach their dreams and achieve new heights of their artistry. It was indeed, a very spectacular opening for the night. ONE OK ROCK took the crowd off the present and brought them back to the past with their back-to-back old songs. A row of stage fireworks burst at the beginning of the song "Mikansei Koukyoukyoku" which made the crowd roar back in joy. The next song played was "Kimishidai Ressha". These two songs surely made the old fans happy, not to mention they were played on one of the biggest venues in Japan. I don't consider myself an old fan since it was only about 3 years when I started going gaga over this band but Kimishidai Ressha is one of my favorite old songs ever since I heard it. Another unexpected song was performed next, "The Way Back". I can't remember the band performing this song at their previous major concerts in Japan so I was very happy and surprised when I heard the intro came in. A row of flame on stage was spewing vertically to the rhythm of the song which added wickedness to the performance. Next was a short break where each of the members gave their messages and asked the crowd how they are feeling. As usual, Ryota went first, followed by Tomoya, then Toru, and lastly, Taka. Lights went off again and a ticking sound of a clock was heard on the background. Every fan knew what song is coming up next. "Clock Strikes". Taka lifted his left arm pointing with his index finger then brought it down in a motion like a hand clock's movement. 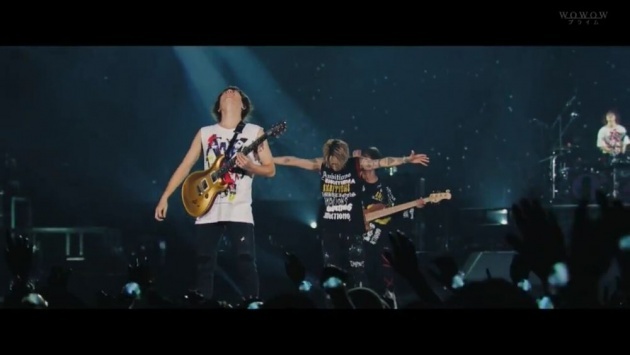 Of course, Taka's long high note was again witnessed by everyone. It's truly a magical song, no wonder why it is always included in their set list. Confetti during the song One Way Ticket. At a smaller stage in the middle of the crowd. Another staple song during their lives was played next, "Wherever You Are". This time, they were on their second and smaller stage which was located at the middle of the crowd. The people seated farther from the main stage surely got a chance for a closer view of the four. The song was played with its original version. Anyhow, this song never fails to make you feel like falling in love is a very wonderful feeling. Returning to the main stage, Ryota, Toru, and Tomoya played an instrumental song where each of them had their own solo to show off their skills. They were all magnificent although I think Tomoya and Toru had longer exposure than Ryota. I wonder why? Next song was "Deeper Deeper", one of my favorites. I got to see those synchronized headbangs and spins again. And the intense long scream of Taka at the end has always been satisfying to my ears. The live version of this song is truly gold. Yellow streaks of lights filled the stage for the next song, "I Was King". This song is so nice and has that climax at the end where Taka screams "I Was Kiiing!" repeatedly. I really like that part. And like I've mentioned before, I love Tomoya's drum pattern for this song. After it was another staple song, "The Beginning". The hype on this song never fades no matter how many times I've seen it played live. Green and pink lights colored Tokyo Dome while the crowd's bracelets pulsed to the rhythm of the song. (From left to right: Masato, Taka, Koie, and MAH) And my favorite ONE OK ROCK photographer, Julen, sneakily taking photos on the far right. I was expecting the song Mighty Long Fall to come next but it looks like the usual sequence was finally broken to give way to a very special performance. Taka, together with three special guests, Masato of coldrain, MAH of SiM, and Koie of Crossfaith performed the song "Skyfall". The three guests came out on the extended stage through a stage lift. I've already seen a photo of this performance last April but I have forgotten about it already so this had surprised me for the second time. They proclaimed their special collaboration as the "Japanese Dream Team". Yes, definitely a dream team! And I was crying my heart out because it was too awesome. I wish these three vocalists would go on tour with ONE OK ROCK (especially Asia Tour) so we could be blessed to see this rare performance too. Or these three vocalists can bring their bands too and the tour can turn into a music festival instead. 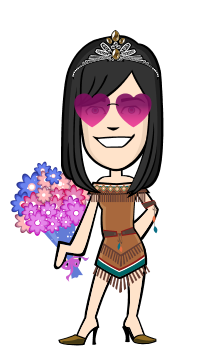 (I wish it really happens!) Going back to the performance at the dome, the stage became so much fun with all these vocalists singing and screaming. (I didn't know MAH can suavely sway his hips until this performance.) They ended the song in full force by repeatedly screaming "Skyfall!" simultaneously. Finally, the song I was expecting after The Beginning came next. "Mighty Long Fall". This powerful and lively song will surely bring your feet jumping and your head banging. And as always, Taka's screams at the end is splendid. However, the crowd wasn't able to make any mosh pits because all areas were seated. Sad news especially for those who loves moshing. Last song for the night was an old song entitled "Nobody's Home", a song about family and dreams. It's a rock song but it can certainly make you shed tears. I don't understand much of its lyrics but the melody and Taka's emotion while singing this song was enough to convey the song's message. Oh wow, the songs on the second half of the show was so intense! I'm kind of envious to those who have gone to this show. I thought it was over but WOWOW also aired the three encore songs. Usually, the encore songs are not aired on television but included on the DVD version, so this was something new. And I am of course, very glad they have included it. A pissed off Taka and an amused Tomoya and Toru. First was their latest song, "Change", wherein Taka had forgotten the English lyrics of the second stanza. Actually, he had already messed up the first line of the song. I don't know if others have noticed it because they were all so focused at his mistake on the second stanza. 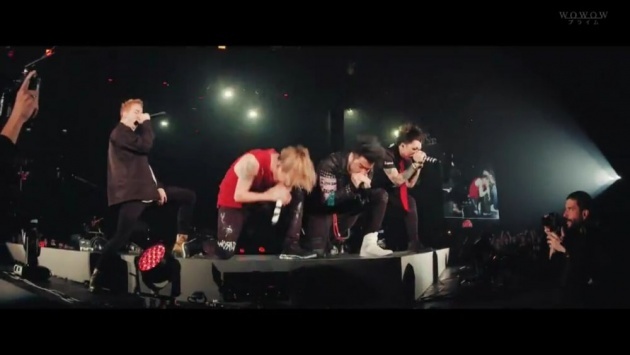 Taka apologized to everyone when the song ended, then kicked the floor and his metal platform stand several times before making a pose with his one hand unconsciously making a "fox sign" of Babymetal. (Don't worry it's probably just me who've thought it's a fox sign. This is what happens when you watch too much Babymetal.) The crowd laughed on what they saw, Taka then screamed their next song. The undying song, "Kanzen Kankaku Dreamer" came next. It was, of course, at the encore. This song is awesome as always, so lively, it awakens every part of your soul. Although I have to be honest, I like the version on their Nagisaen show better because of the huge spectacular fireworks and the cinematography was more beautiful. Anyway, like I've said, this song is awesome as always no matter how it is performed. The real last song of the show was "We Are", a very emotional and uplifting song. Seeing the whole crowd light up again on this song was just so lovely. I can feel all the emotions, from the band to the crowd, even if I was just witnessing the show through a screen. Hearing the crowd sing their part was also overwhelming especially when the camera panned through the huge crowd of 55,000 people. Confetti rained again on the last chorus. With this song, you would definitely be singing along from the bottom of your heart. The song ended with Taka running to the main stage to make a high jump but it seemed like he was already exhausted because he wasn't able to do it like he used to. Tomoya, Toru, Taka, Ryota, and ONE OK ROCK staff. Indeed, what's the best way to end the Ambitions album tour? A dome tour, of course! 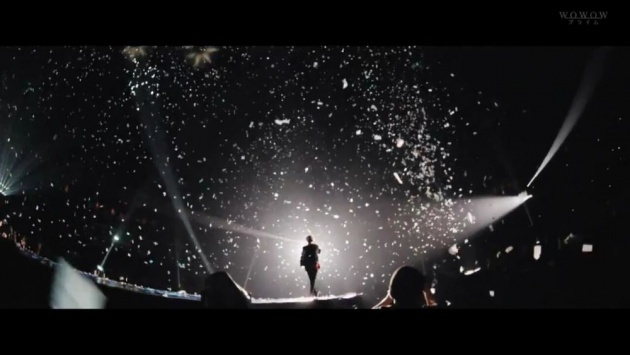 Their dome tour is probably the most spectacular concert of ONE OK ROCK. It was huge and grand. They have definitely ended it big and memorable. Overall, they were able to do 99 shows all over the world for their Ambitions album tour. (I'm glad I had seen one of their 99 shows!) Here is Taka's post showing the list of their 99 shows! The songs on this blog is not the entire set list of the show, thus, only the selected songs to be aired on WOWOW. We have to wait for the DVD release to see the entire show. I heard they also played other old songs. But the DVD would surely not come out soon; probably early next year. Toru, Taka, and Ryota walking to the extended stage for the song We Are. My favorite performances from the dome tour are The Way Back, One Way Ticket, Skyfall, We Are, and Change. The song Change in Tokyo Dome was memorable so I added it to my favorites. This is not the first time Taka had messed up on the lyrics and it's understandable for him to forget some of it because English is not his primary language. And at least we know that he sings live. After the dome tour, the band focused on creating their next album. They have no concerts scheduled so far but they will be performing on some music festivals in Japan (Summer Sonic 2018, Dead Pop Festival 2018 and Sweet Love Shower 2018). Taka also went to Identity LA as Mike Shinoda's special guest for the song Where'd You Go. Follow their official accounts for updates! (Official website, Facebook, Twitter, Instagram, Youtube) And listen to their songs on Spotify and iTunes! You can also follow each member on their official Instagram accounts: @10969taka, @toru_10969, @tomo_10969, @ryota_0809. Ugh! Nevermind! I'll just wait for their new album and dome tour DVD to come out. I can't wait to hear how the band's "2nd chapter" would sound. As Taka said, ONE OK ROCK will be moving on to its next chapter. And we'll certainly get to hear the change he's talking about on their upcoming album. ONE OK ROCK flies to Fukuoka with Honda Jet for the last stop of their 2018 Ambitions Japan Dome Tour. Before I end this blog, let me share to you a video of the band members taking a ride in the Honda Jet for the first time. They rode the Honda Jet to get to Fukuoka for their dome tour. So yes, still related to the dome tour! Fukuoka is their last stop for the dome tour, so make the grandest arrival possible! Travel with Honda Jet! Their song "Change" was used for Honda Jet's commercial. Did you attend this Rock concert?